Studio042 can print or reproduce almost any size document, whether it’s a hard copy or a digital document. We’ll reproduce your documents to scale, enlarge or reduce to any size. And, our business centers are equipped with packaging and mailing services to get your bid delivered quickly. We print from a variety of different files, including PLT, DWF, PDF and TIFF. 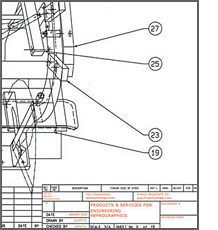 Let us print, package and ship all of your construction and engineering documents. Our production hours have been extended at both ends of our day to accommodate our Engineering related clients. We open early at 8:00 AM and stay open until 6:00 PM for your convenience. Upload your files by clicking on the “send a file” button on the right side of this page, or mail them, most jobs can be done while you wait or in just a few hours.